The innovation proposed in this project is to conceive diagnosis station and testing system, not as fixed but as flexible systems based on mobile robots equipped with mechatronic modules and diagnostic sensors. The robot will be interconnected with the production system in order to exchange data useful for controlling process and products, and to achieve the full integration of measurement processes with the rest of the production system. The availability of advanced sensors on board of a mobile robot offers several advantages. The main one is an increased flexibility and adaptivity, achieved thanks to the ability of the robot to move even in a low structured environment and to reconfigure the measuring task depending on the type of product and its position. In life test laboratories, the main advantage is that a mobile robot allows the sharing of sensors moving from one machine to another according to a serial sequence. 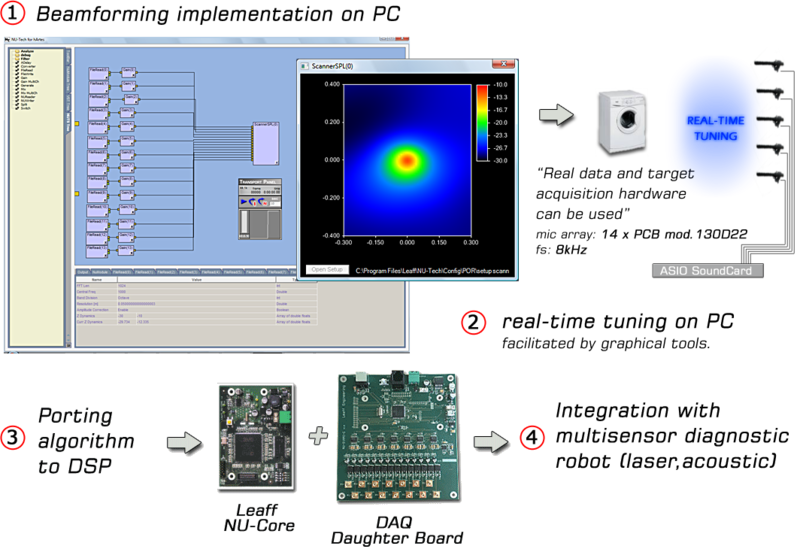 This avoids replicating the same measuring instruments on the various stations operating in parallel in a test lab, and makes the strategy proposed competitive in relation to classical solutions, allowing the use of few measuring instruments but more complex in order to guarantee a high level of product quality. The automation of measuring and diagnosis in production and in life test laboratories also pursues the objective of ensuring a high standard for repeatability and reproducibility of the tests. It is very important in a context where a large part of tests is performed by human operators, both in terms of technical improvement of the measurement process and in terms of avoiding repetitive and fatiguing occupations. Development of a mobile robotic platform: The project involves the use of a mobile base capable of moving within a structured space. In order to improve the autonomy, reliability and efficiency, cognitive skills are enhanced through techniques to detect obstacles, sensor fusion, self-localization, map building and coordination. Development of sensors and measurement methods suitable for use on mobile robot: Appropriate sensors are developed so that the system can analyze the machines tested in the laboratory or along the production line through visual inspection, measurements of noise / vibration. Co-funded by: Regione Marche - POR MARCHE FESR 2007-2013 Intervento 1.1.1.04.02 "Promozione ricerca industriale e sviluppo sperimentale in filiere produttive"